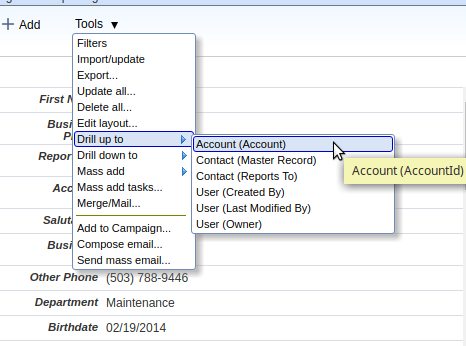 From within any console view (the "All records" view) or tabular view, the Tools menu offers abilities to drill up, drill down or add records en masse. When you click the drill-up option, Apsona displays the records in the object to which you have drilled up, and shows just the drilled-up-to records. It also shows a filter that indicates the how the drilled-up records were selected. The drill-up preserves the view type (console or tabular view). Thus, if you drill up from a console view of Contacts to their Accounts, the drill-up displays a console view of Accounts. 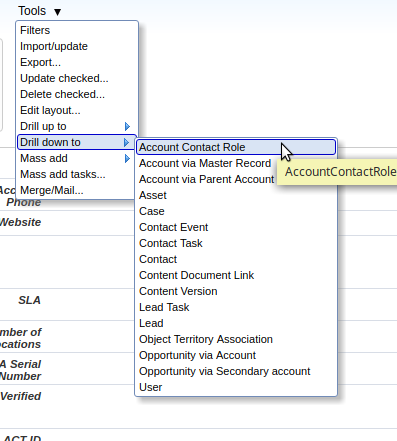 And if you drill up a tabular view of Contacts, the drill-up displays a tabular view of Accounts. The list of items in the "Drill up to" menu contains only the objects which are visible in the current user's Apsona configuration. See this article for info about visible objects. The drill-down operation is essentially the inverse of the drill-up operation, in that you would drill down from a parent object to a child object along some lookup field in the child. For example, given a selection of Account records, you can drill down to the Opportunity object to find all Opportunity records obtained from the selected Accounts. See screen shot below. The drill-down operation behaves quite similarly to drill-up, in that it shows a filter representing the selected records and preserves the view type (console or tabular view). Also, the list of objects available in the drill-down menu contains only those objects which are visible in the current user's Apsona configuration. The "Mass add" menu enables you to add a single child record to each of the selected parent records. 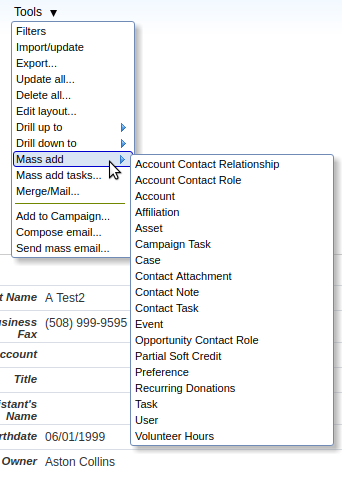 For example, you can select a bunch of Opportunity records and add a Task or a Note to each of them via the Mass add operation. So the "Mass add" menu item lists all the visible objects which are children of the current object, and when you click on one of them, it displays a popup window that lets you add records corresponding to that child object. The layout of fields in this popup is the same as those in the standard "Add" popup for the child object, so you can set up the popup's layout by clicking Tools - Edit layout in the child object and then editing the fields in the Detail panel.